In 2016, public relations saw its share of highs and lows. But perhaps the most notable thing in the industry this year was the way it evolved, thanks in large part to constantly-changing technology. PR folks now have more ways to get their clients’ messages across than ever before. With the year dwindling down, it’s time to start looking ahead to 2017. Here are five predictions for the coming year. Specialist firms will grow. Traditionally, PR firms have juggled a wide range of clients across many industries, and the largest agencies still do that, of course. But there’s been a shift towards specialist agencies that focus exclusively in PR for companies in sectors like technology, fashion or real estate. Clients find comfort in specialist expertise because they benefit from deep experience in relevant sectors, and because they’re not paying for the hefty overhead of an agency with staff in 30 different areas. As brands and organizations grow more sophisticated about the benefits of specialist public relations firms, many companies will look to them for their communications needs, possibly using multiple specialist partners rather than a single large agency. PR professionals will need a broader range of skills. For as long as the discipline has existed, communications and writing skills have been instrumental to success. But these two alone aren’t enough to cut it in today’s PR landscape. With the rise of social media, digital technology, and more, PR professionals have to stretch. Creative content development, influencer outreach and integrated communications require broader skills – like research and analytics, digital design and production, and risk management, which has matured into a critical communications function linked closely to legal strategy. There are also “softer” skills and steps we mentioned in an earlier post – that will help superstars break out from the pack and thrive in this ever-changing industry. Data will be even more important to public relations. This past year saw an uptick in the way data is used in PR. Tools like Digimind help to easily monitor and analyze complex sets of data in areas like social media, and as the technology advances, PRs are finding new ways to use it to communicate, from surveys to keyword-rich content. But data can also inform an overall communications strategy and its messaging, as many PR agency teams know. The best plans take advantage of the fact that social media data offers real-time information as well as historical. Social platforms have been around for nearly a decade now, providing a wealth of historical data about the behavior and preferences of their audiences. A good PR pro knows how to dig into these insights to help identify emerging trends, old and new customers, anticipate and predict market shifts, and take advantage of tactics that have proven successful in the past. Expect social and market insights to have a greater impact in the coming year as options advance, and the industry finds new ways to apply it to fine-tune programming. Influencer marketing will be front and center. 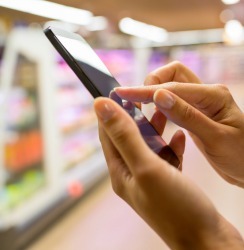 Tapping digital and social influence is the rallying cry of many brands when it comes to gaining ground with key constituents and customers. And PR agencies have become adept at strategically targeting the right influencers in the right industries through appropriate social media channels. This strategy has proved invaluable in growing the Small Town Brewery flavored craft beer line. Crenshaw has repeatedly tapped its “beer friendlies” – a community of craft beer enthusiasts, bloggers and Instagrammers who hop on each new brew and brand activations that are less about product attributes and more about corporate responsibility or brand values, like Small Town’s recent “Movember” campaign. Influencer marketing will only become more popular and results-oriented as its role grows within brand marketing and reputation management programs. Check out these tips from experts that give some insight into the best ways to dominate the influencer marketing game. Technology will evolve. Technology has changed the way we consume information, from smarter cell phones to the explosion of video, and particularly live streaming through platforms like Periscope and Facebook Live. Yet public relations is not scaleable in the way that digital advertising and direct marketing are. But in 2017, fueled by data use and software tools, the earned media outcomes and social media exposure that result from PR programs will increasingly help to scale other key metrics of brand health, including organic search results, social awareness, and inbound website traffic. And while technology will continue to evolve, it seems that robots, which we know are poised to take over so many jobs, aren’t entering PR just yet. According to some McKinsey research into the least automatable jobs, PR is up there in the top five. Enjoy it while you can! 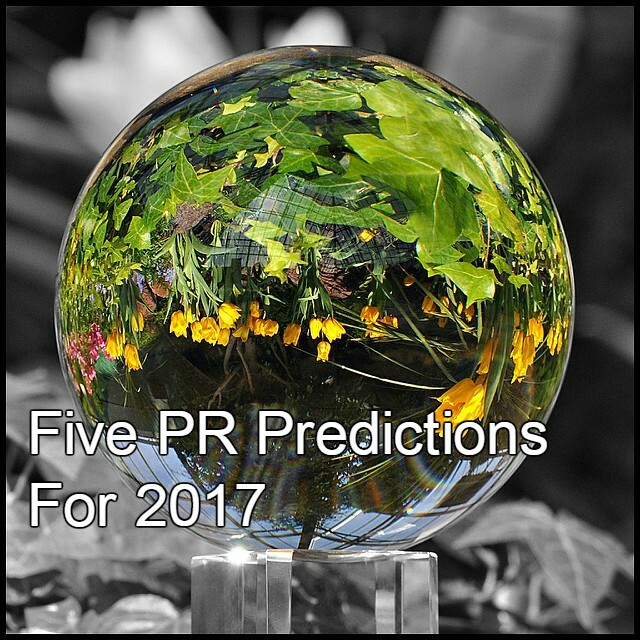 Glad you found this post of PR predictions of 2017. Thanks for research on this one.You’re such a gem for providing this information!